Carpet Cleaning Auckland Wide: North Shore, Auckland City,­ West Gate, East Auckland, Manukau, Papakura, West Auckland, Rodney. TOP RATED Carpet Cleaner in Auckland. Are you looking for the best carpet cleaning? Over 1000+ happy Trade Me customers can’t be wrong. I am fortunate to be known as the #1 carpet cleaner in Auckland as I use the best materials and extremely good equipment, doing a 100% VERY COMPREHENSIVE clean. At the same time this is very affordable and I am a genuine, trustworthy person to deal with. -If cost is an issue we can find a good option. I am affordable. I have serviced more than 1900 homes. Routine carpet cleaning? Stains? Dirty carpet? Soiled upholstery? Messy couch? Dirty shower glass door/wall?Whatever it is, I can take care of it. We work 7 days per week with NO EXTRA CHARGE on public holidays and weekends. If you’d like your upholstery and carpet to look fantastic again, do not t hesitate to give me a call and I will be more than happy to help you and provide fast, friendly and service. You can have your place looking fantastic again, quick! I also do pest control and car valets. See my great reviews below for many happy customers. Once I’m done, you’ll be very happy with the results! Alex cleaned two sofas, a mattress, dining suite and a rug. Very happy with result. Alex is a clear winner! Alex did exactly as discussed, just way quicker than I expected. No complaints, quick clean tidy in and out no drama. Well worth the money and would definitley use again. Thanks Alex see you next time. Alex is a great person and professional. I was using his service again. Very happy with the quality and result. Now my house will be sold easier. I've had our carpets and oriental rugs recently cleaned by Alex Cleaning Solutions. This is a standard service for us, but this time we've had our upholstery cleaned as well. The result is equally brilliant. Highly recommend. Alex is professional and does a great job every time. will def use again in the future. Fabulous job! Friendly service and clean carpets! Thank you Alex. Just read the reviews, super friendly guy and did a good job at a fair price. We are very pleased! Thank you Alex for coming in after hours, what a difference the clean on the couch's & carpet has made! I would definitely recommend Alex to all! Will be using his services in the year to come! Alex came over at short notice to clean our new shaggy rug. We were worried the stain would ruin the rug altogether, we called Alex in the afternoon and he came over that evening and removed any trace of the stain and got it back to new. A+ service. Highly recommended. we had two showers cleaned and a protective treatment applied to them. The service was fantastic and very thorough. The showers look new. Lovely people to deal with too. All good. Rapid service,, reasonably priced and cleaned to a high standard. Fantastic service,Alex went above and beyond. Was on time, was polite, accommodating to my tenants when organizing and under going the carpet cleaning. I Highly recommend. 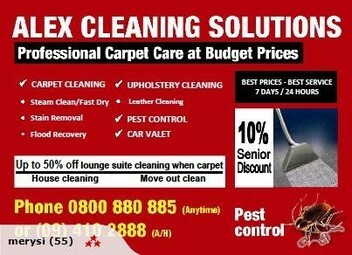 One of the best carpet cleaning services I've used ever. Very reliable service, with high attention to details. Won't even consider looking someone else in future.